Educating people on the importance and significance of renewable energy sources should start early. SMK Langkon did just that. With some help, of course. 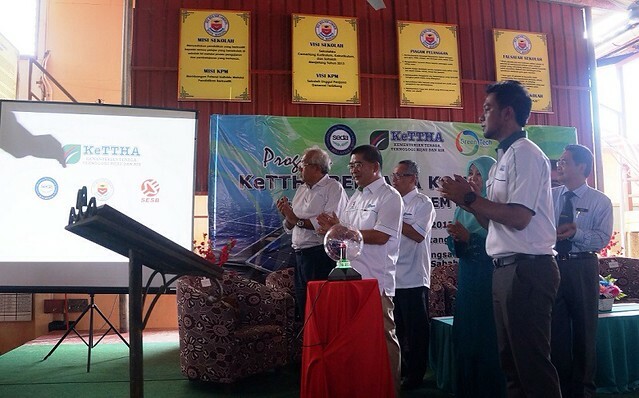 A couple of weeks ago, SMK Langkon in Kota Marudu, Sabah became the recipient of a 9kWp solar photovoltaic (PV) system that will generate electricity while saving the school on electricity bills. The installation of the system is a project undertaken by the Energy, Green Technology and Water Ministry with Sustainable Energy Development Authority (SEDA) and SESB to promote and spread awareness to the students and local community on the importance of renewable energy. The project would be a model as it is the first time net metering system is used in Sabah by SESB. With this system, the balance of energy produced in the premises that is not utilised is sold back to SESB. The school will only pay the net electricity bill after the amount of energy generated from the solar PV system is deducted. The project cost around RM90,000 and is sponsored by Syarikat Warisan Harta Sabah Sdn Bhd. This means that it cost the company RM10,000 per kWp, slightly higher from the current market rate of RM9,000/kWp. The school was chosen because the site houses two schools – the SK Langkon and SMK Langkon, enabling the students there to have first-hand exposure on the subject of renewable energy. The school is also often used as a temporary relief centre for flood victims in the district and electricity disruption can easily occur during a flood. Not a first for school, but a good start nonetheless. SMK St. Michael in Penampang launched its 5.4kWp rooftop solar PV in March this year thanks to an initiative by German company, Deutsche Energie-Agentur GmbH. I believe more schools in the interior should be fitted with solar PV, there are still many schools out there without grid power. Students can then be taught to become installer/entrepreneur in anticipation of the implementation of the Feed-in Tariff mechanism in Sabah later. TheGreenMechanics: There's nothing wrong with installing solar PV at SMK Langkon, but priority should be given to schools without power supply from SESB. Agree?